Note: You can find previous installments of this series by clicking here, Introduction, Part 1. 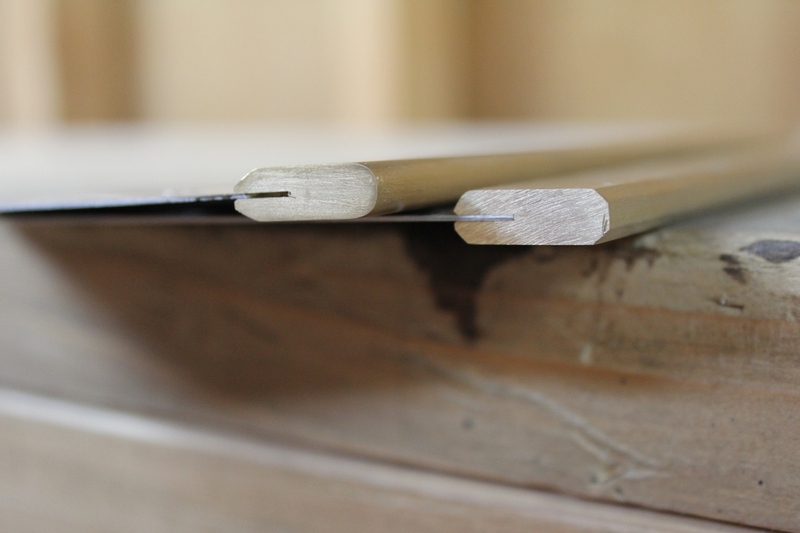 Most joinery saws have some kind of back, or spine, to stiffen the blade because the blades on these saws are typically quite thin and could easily buckle without some kind of support. Historically, small saws, like dovetail saws, had brass backs, while larger saws had iron (steel) backs. These days, steel backs are very rare on new saws as most manufacturers have gone to using brass for backsaws of all sizes. Of course the choice is yours when it comes to backs. I have used both brass and steel to make backs for saws, and by far, brass is much easier to work with. It files easier, it bends easier, it sands and polishes easier, and in most cases, it looks prettier. 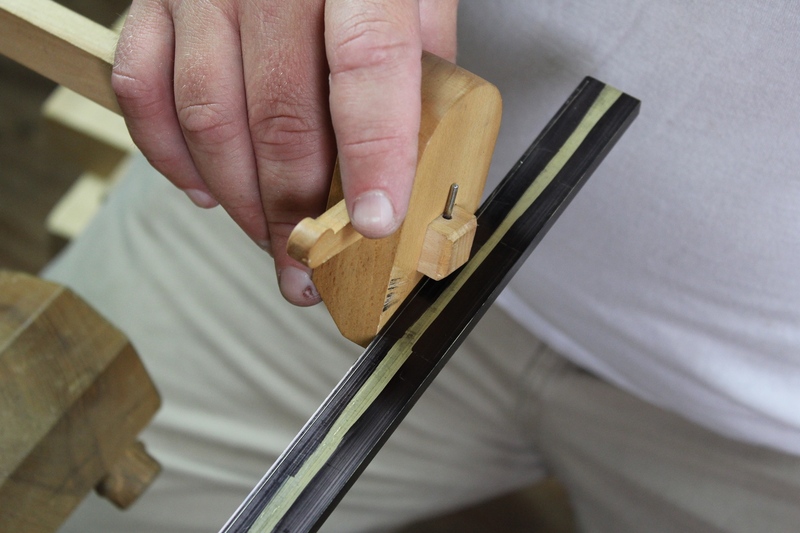 If you are making your very first saw, I recommend that you use a brass back. Yes it will cost you a little more in materials, but it will save you in work and frustration. Once you have chosen a material you need to decide whether to purchase a ready made back, or to roll your own. Once again, I have done both, and by far, it is worth every penny to purchase a ready made back, unless you plan on going into business making saws. Making a folded back is a royal pain in the rear end without specialized, heavy duty metal bending equipment. I’ve tried numerous ways of making folded steel and brass backs using the basic tools that most serious amateur makers would have available to them, and none are particularly easy, predictable, or elegant. As for milled backs, making these requires special milling machines that most home shops do not own. So once again, I am going to recommend that you purchase a pre-folded or milled back from someone like TGIAG Toolworks or Blackburn Tools. I’ve used the products offered by both and can 100% recommend them. Saw backs can either be milled from thick solid bar stock, or folded from thinner stock. After you choose your material and decide whether to purchase your back ready made or make your own, it’s time to decide on a style. You basically have two choices, milled or folded. If you want to go with milled, your only choice is brass. I’m not aware of anyone making milled steel backs. If you want folded, you can have your choice of materials. Now, someone is most likely going to tell you that milled backs are inferior and that folded backs are the only way to go. Ignore them. Anyone that tells you that one type of back is better than the other is trying to sell you something. I’ve used saws with both kinds of backs. I’ve built saws with both kinds of backs. From the standpoint of the user, there is absolutely zero functional difference between a well made saw with a folded back and a well made saw with a milled back. From the standpoint of the saw maker, there is also zero difference in complexity when you are purchasing ready made backs. The only time that one can make a strong case for the folded back over the milled back is in the case of the person who repairs kinked saws. Guess what? I do that too. I won’t argue that a folded back is easier to remove and reset than a milled one attached with epoxy (the typical way that milled backs are attached). Since folded backs are held only by the tension of the fold, they are more easily knocked off of the blade for doing repair work. Milled backs attached with epoxy require that the back be heated up to just above about 150 degrees so that the epoxy bond will break. So while it is more work to repair a saw with an epoxied on milled back, it can still be done. So if a milled back is what you want, don’t let anyone talk you out of it. 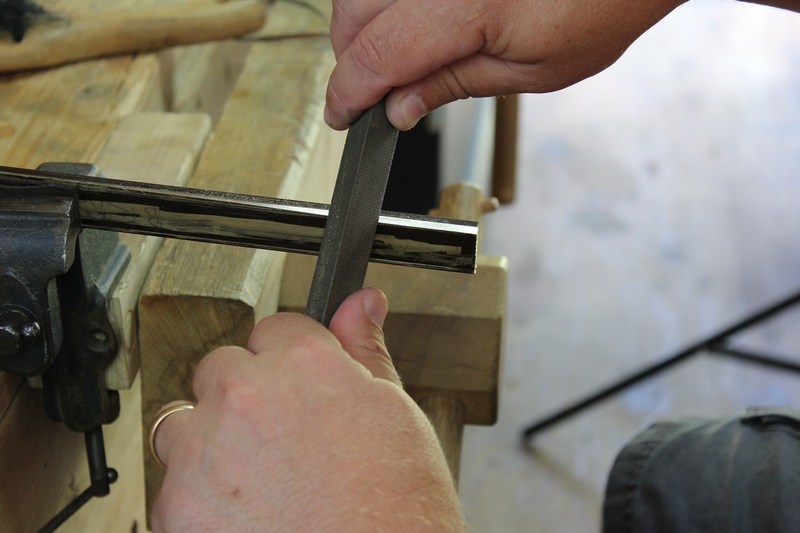 A regular woodworking marking gauge with a hardened tool steel pin can be used to mark brass. I’m using milled backs for the saws I’m building because that’s what I have. If I had folded backs on hand, I’d use those. Use whatever you like. The process is the same up until it comes time to attach the blade to the back. When you receive your back, it will be a simple piece of brass or steel. The makers of these backs do not mill or file any decorative details into the back. That job is up to you. This is why I recommend you start with a brass back. Brass is much easier to file. I’m making two different styles of milled brass back. The first just has decorative bevels filed on all of the long edges and the toe. The second has decorative bevels filed on the bottom long edges while the top is rounded over to resemble a folded back. 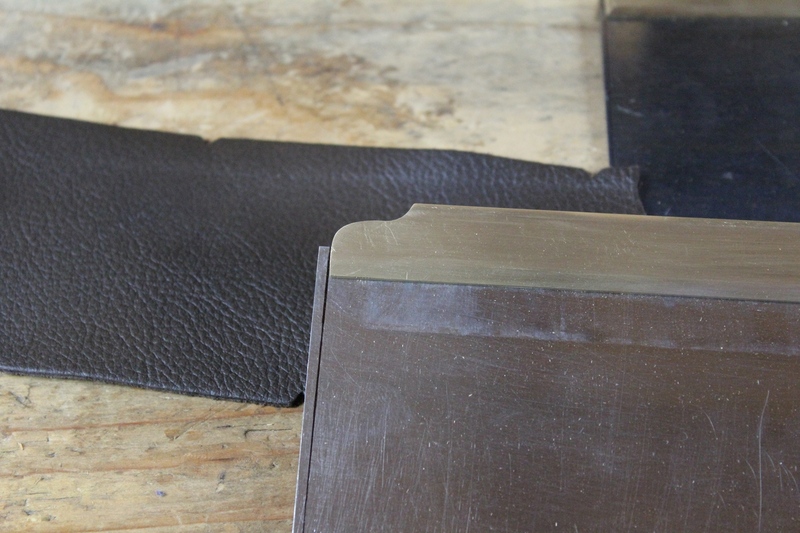 Both styles begin exactly the same – by filing bevels. Just like with wood, when you want to make a consistent bevel, you need proper layout lines to work to. I color the metal with a permanent marker so that the layout lines show up better. Then I use a regular marking gauge with a hardened tool steel pin to scratch layout lines in the marker. 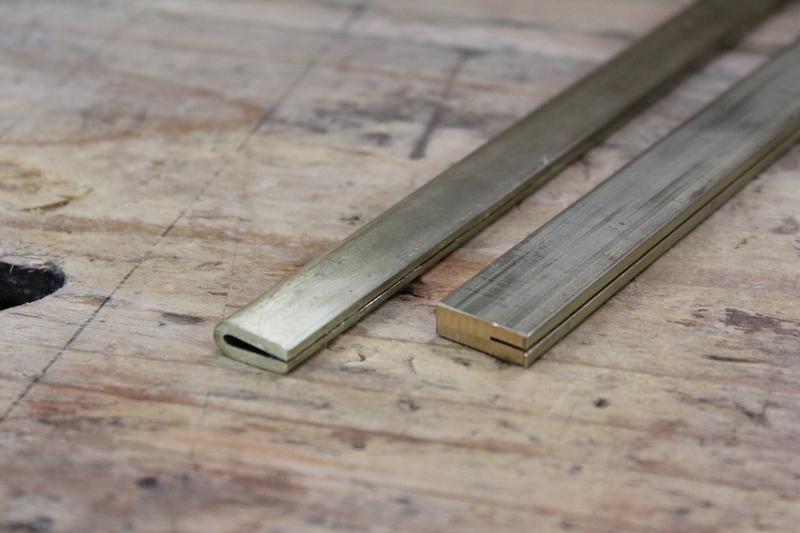 If you are using brass, the steel pin will actually scratch a layout line in the metal itself. I am laying out a line at 1/16″ from each edge. These lines will tell me how much material to file away. I’m filing a 45 degree bevel. If you want an asymmetric bevel (more bevel showing on the wide faces vs. the narrow edges), just lay out 1/16″ on the narrow edges and something wider on the wide faces. This is nothing more than a design feature that is totally up to you. It has no impact on function, only aesthetics. 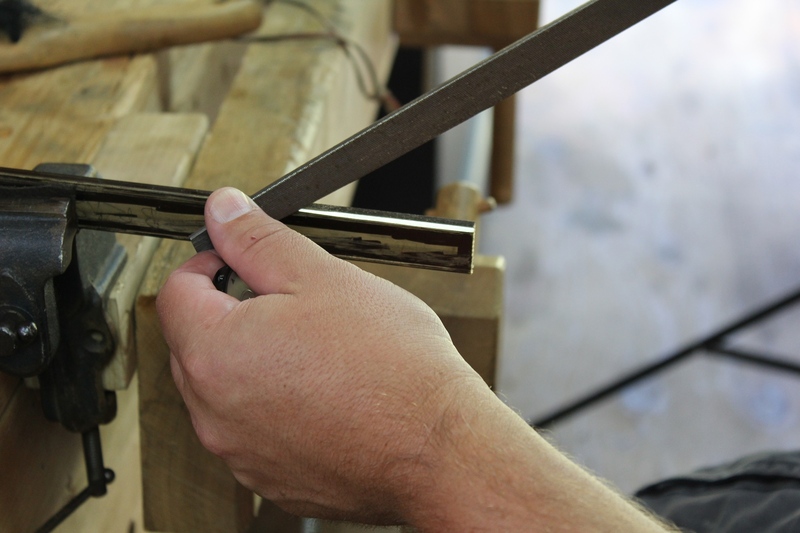 With the bevels laid out for the long edges, I clamp the stock in a metal working vise. I only have a small model maker’s style, but it works fine. I clamp a scrap of leather between the brass and the jaws to prevent marring the stock. Then I begin filing. I start by cross filing. This is what you might call regular filing – i.e. just pushing the file forward across the corner of the stock. This method of filing removes material quickly, but doesn’t always leave behind the best surface. But that’s okay at this point. I have a lot of filing to do so I want to get the bulk out of the way as quickly as possible. I work with small sections at a time, trying not to file too far from the vise jaws in order to avoid chatter. After filing just a few inches, and staying shy of my layout lines, I move the stock in the vise and work the next small section. …but draw filing refines the shape. After cross filing to remove the bulk of the material, but still leaving the layout lines, I switch to draw filing. To do this, I hold the file with both hands perpendicular to the stock, like a draw knife, and push the file forward along the length of the stock. This makes a much cleaner and smoother cut, and removes a lot of the scratches from cross filing. This is also the step where I will refine the angle so that I hit both layout lines at the same time. It’s slower going, but again, I’m refining here, not trying to remove stock in a hurry. Again, I’m working small sections at a time. Once I have all of the filing of the bevels done, the back is ready for polishing, unless I want to make the rounded profile. To do that, I will remove the corners of the bevels on the top side of the back, creating four more tiny little bevels. I continue to refine these corners a little at a time until the back has a rounded profile. Then I will switch to a wooden block with P320 grit sandpaper to start the process of cleaning up and polishing the back. At this point, I’m not doing the final polishing. I simply want to further refine the bevels and get them just right. I will also sand the wide faces to remove the marker and oxidation and blend the scratch pattern of the faces with that of the bevels. The two different profiles give the finished saw quite a different look. The round is more traditional. The beveled is more contemporary. If you want to add any kind of additional decorative work to the back, now is also the time to do that. However, choose your decorative pattern carefully if you are using a folded back. Not every pattern looks good on a folded back, so think through what the individual sides of the back will look like once your chosen pattern is cut into it. For folded backs, I like to keep any decorative work toward the bottom edge so that I don’t cut through the folded top. Cutting through the folded top of the back exposes the top of the saw blade, and to me, this doesn’t look good. A decorative cut like this looks good on a milled back but wouldn’t work on a folded back. However, if you flipped the pattern along the bottom edge, it could work for a folded back. At this point, I’m done with the backs for now. There’s no point in taking the polishing any further right now because they are bound to get scratched up between now and final assembly. But with all of the metal shaping done, I’m ready to start on the handles. Nice work, Bob! I’m just curious how long this process takes. I’ve never built any kind of tool before, so I have no concept of task time when it comes to metal working. I can do one brass back to this point in about an hour and a half to two hours. I’d estimate that an entire saw, start to finish, takes me about 10-12 hours. at $15 an hour, that’s only $150 per saw 😉 Definitely not the sort of thing that you can easily make money doing unless you have an incredibly streamlined process. When I recently made my first backsaw handle, it probably took me nearly that long just for the handle. Someday I may try to do a full saw build using a back and blade from tgiag, but I’m content with my current collection of saws at the moment. No, certainly not something one can make a living at without batching out parts and buying materials in bulk, and having some machines to speed some of the steps up. Guys who are making a living making saws are not hand filing the bevels on their saw backs, and they’re not hand polishing with sandpaper either. If I was going to make a go of something like this full time, I’d make sure I had the equipment to make it possible. And makers like Bad Axe are getting a lot more than $150 per saw as well. Their 14″ sash saw is currently priced at $275, and that’s before adding any bling 🙂 . Yep, Bad Axe can sell their saws for considerably more than $150, but they’ve spent years developing a reputation for top-of-the-line quality. I think that if I made a saw to sell, it’d be very hard for me to convince somebody to pay enough for the saw to even cover my costs and labor, much less make a profit. Of course, that’s partly because I’m inexperienced. But many people (especially those new to the craft) balk even at the cost of a veritas saw, let alone a Bad Axe saw. But my bigger point (obscured as it was) was that there’s a good reason that quality saws are as expensive as they are.